OAKLAND — The 662 bus route to Skyline High School stops near 40th Street and Adeline Street at 6:52 a.m., but on this day it is running late. 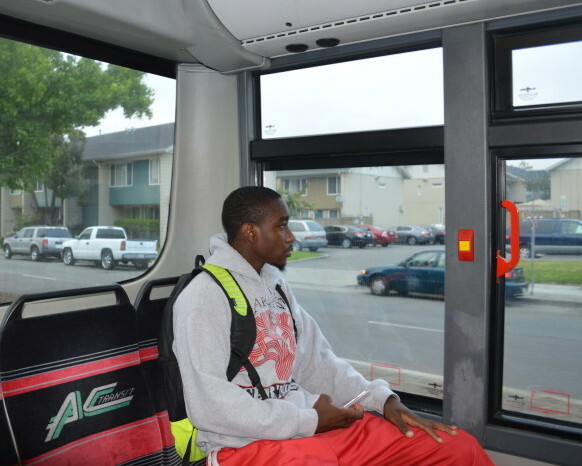 “Sometimes, it’s a gamble,” said Darrion, 17, a senior at Skyline High School, who waits for the bus most days after catching the 26 route from his home in West Oakland to the scenic campus in the Oakland Hills. As 6:52 a.m. becomes 7:10 a.m., Darrion starts to cross the street to catch another route with hopes to get to school before it starts at 8:05 a.m. But, as he walks his way up 40th Street, the 662 appears at the corner of San Pablo Avenue and makes the turn. “Let’s go,” said Darrion as he hustles back up the street to the bus stop. The bus speeds past three stops before picking up eight more students bound for Skyline at Moraga Avenue and Medau Place in Oakland’s Montclair district and reaches Skyline at 7:55 a.m.
Darrion is one of just over 48,000 students in the Oakland Unified School District that travels a combined 254,000 miles each day in some capacity to attend school, according to data in the district’s Strategic Regional Analysis (SRA). The SRA is a data tool the district developed to assist in its 2015-2020 Strategic Plan. The tool splits Oakland into five regions (Central, East Northeast, Northwest, and West) based on similar demographics and data points. Data within the SRA includes: demographics and enrollment, neighborhood and environmental stress factors, number of students that attend and decide to leave district-run schools, performance of schools, school choice, and other points. Distance traveled data and what the district calls Live/Go patterns — data on where students live and where they go to school — make up one data set highlighted in the 178-page report that is expected to be updated and enhanced over the years to help the district provide quality schools for each neighborhood. Oakland Unified School District has an open enrollment policy that allows students to attend schools across the city even if those schools are not in their neighborhood or region. According to SRA data, 16,839 of the district’s 48,181 students (or 35 percent) travel outside their region to attend school. If the district can provide quality schools in every neighborhood, the cumulative round trip distance traveled by students could drop from 254,000 per day to about 70,000, Radke said. Defining quality is a difficult task, with the currently suspended Academic Performance Index (API) most often used to measure quality. The district, however, is working to develop better indicators of quality that are rooted in local data. The Northeast Region has the highest percentage of students (56%) that travel to attend school somewhere else in the city, and also has the most daily average round trip miles traveled per student at 6.7. West Oakland students travel the second farthest to get school, logging an average of 4.6 round trip miles each day. The West Region also had the second highest percentage of students, 49%, that live in the region but choose to attend a school in one of the four other regions. Darrion said both his parents agreed that they did not want him attending school in the West Region and allowed him to choose between Oakland Tech and Skyline. One of Oakland’s top track athletes, Darrion said he picked Skyline because of its location and its computer science and technology academy. And for the past seven years, Darrion has begun each school day at 5:30 a.m. to catch two to three buses and make the hour to hour and a half trip across Oakland to go to school, first at Bret Harte Middle School for three years and then for the past four years at Skyline. Darrion’s journey to Skyline can take anywhere from 60 to 90 minutes to complete. His trek home is just as long, but with track practice and his other extracurricular activities that include filming various school functions, Darrion often doesn’t get home until 7 or 8 p.m.
And as the bus pulls into Skyline’s roundabout with 10 minute to spare before school starts, Darrion is asked why he has kept up the journey for so long.